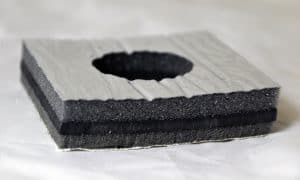 By understanding how C-press injection molding works and the advantages that molded corners provide, engineers can make strong decisions about gasket fabrication. In this article, the second in a series from Elasto Proxy, we’ll continue our coverage of joining methods. Next week’s content, the last in our series, will examine cold bonding. 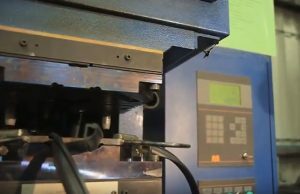 C-press injection molding refers to a joining technique that uses a machine with a heated barrel, two metal plates (i.e., the top and bottom halves of the mold), and tons of pressure. First, uncured rubber is heated and pushed through a barrel by a screw. This molten rubber flows into channels on the bottom plate or mold half. There, cut lengths of a solid profile are positioned so that they are parallel to each other. After the molten rubber flows into this part of the mold, a moveable plate with additional cut lengths of rubber presses down on the bottom plate. In the top half of the mold, these cut lengths are positioned so that they’re perpendicular to the bottom halves. By assembling the two halves of the mold together, a bezel or picture-frame style gasket can be formed. Next, hydraulic pressure is applied. The corners are formed, the top plate or mold half is removed, and cooling occurs. To speed gasket production, Elasto Proxy has three C-press molding machines at its headquarters near Montreal, Canada. 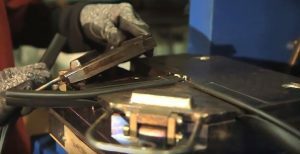 Elasto Proxy’s Simpsonville, South Carolina (USA) facility also has bonding or joining capabilities for gasket fabrication. For engineers, it’s important to understand that molded corners require tools made of machined metal. Depending on the finished gasket, the cost of a metal mold can be significant. Once a mold is made, however, Elasto Proxy can store it for you and use it repeatedly. With large jobs that require the use all of our C-press molding machines, your tooling costs are limited to the cost of the first mold. Molding is the only way to achieve rounded corners for rubber gaskets. 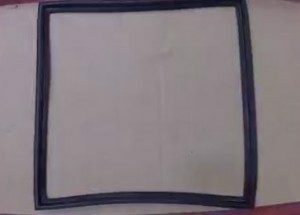 This bonding method is also recommended for gaskets with corners that will be subjected to pulling or stretching. Compared to corners that are hot spliced, rubber molding produces stronger joints for increased resistance to leaking. Molding is also recommended for bulbs with difficult shapes. 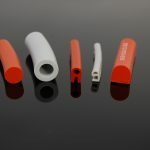 In addition, molded corners can enhance the appearance of custom rubber gaskets. Importantly, this joining method works with a variety of elastomers. At Elasto Proxy, these compounds include neoprene, EPDM, PVC, and Viton gaskets. Molded neoprene gaskets provide good resistance to oil, petroleum, water, and weather. Molded EPDM gaskets have excellent resistance to ozone, sunlight, oxygen, and severe weather. Molded PVC gaskets are strong, lightweight, and inherently fire resistant. Molded Viton gaskets provide fuel-resistance at extreme temperatures. Elasto Proxy does not mold the corners for silicone gaskets and has not worked with thermoplastic elastomers (TPEs). Sponge profiles do not support C-press injection molding. Are Molded Corners Right for Your Rubber Gaskets? Would you like to learn more about molded corners for rubber gaskets? Elasto Proxy is ready to help. 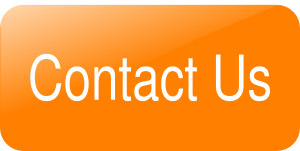 For more information about gasket fabrication, please contact us. 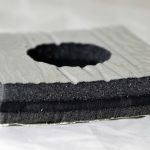 Solid Rubber vs. Sponge Rubber: What’s the Difference?